Nathan 'Carnage' Corbett: What's Next? Post-sparring analysis after Carnage gave me a sound beating. The last time this magazine visited Nathan ‘Carnage’ Corbett, he was a month away from meeting a man roundly considered to be pound-for-pound the world’s best fighter, Tyrone Spong. After being knocked down in the second round, Nathan recovered from wobbly legs to down Spong with a spectacular right hook. Controversy set in quickly, however; Nathan failed to see the referee wave off the contest and thought the fight was still underway. Seeking to capitalise on what he believed to be no more than an eight-count, he punched Spong all the way into the middle of the week after. When the dust had settled, the fight had been ruled a no-contest. In the aftermath, Spong made the shift into the K1 Heavyweight division. The change in size – both weight and reach – of his opponents made for a tough transition. He has lost to fellow Dutchman Gokhan Saki, defeated the Japanese under 100kgs champion, Kyotaro, and recently lost to perennial favourite, Frenchman Jerome LeBanner. Things haven’t been quite so busy, however, for one of Australian kickboxing’s favourite sons. “After the Spong fight, I thought it was all going to happen for me,” says Carnage. “But then, nothing. I fought some Dutch guy from Ramon Dekker’s gym, but he didn’t turn out to be much.” Nathan is referring to Michel Andrade from the famous K1 gym, Golden Glory. Andrade trains among names such as Gokhan Saki, Errol Zimmerman and Semmy Schilt. Andrade made a lot of noise at the press conference, but was swiftly silenced during the fight. “I cut him with an elbow in the first round, and the ref stopped it in the second.” Other than that, Nathan’s opportunities have been lean. Having dominated the cruiserweight division, the only open road led to heavyweight. “I trained hard to try and get on K1 Tokyo in April, but it didn’t happen.” The reasons for this were unclear. Nathan’s next significant date was on the operating table. “I had both hips shaved,” he says. “I’ve got this thing where the heads of my femurs have been growing over. The operation was to shave the growth off the bone so it all moved smoothly. I also had my groin lengthened and a similar operation on my shoulder joint.” These operations meant Nathan could not exercise for the following six months, unless it was rehabilitation. His first fight of the night was against Shane Tilyard, a man with both professional boxing and kickboxing experience. It appeared that Tilyard caught Corbett early with a sharp hook. It was ruled a slip by the referee, however, and the action resumed. Carnage kept his guard tight and soon landed a knee strike to Tilyard’s mid-section, dropping him for an eight count. He followed this up with a smart knee to the head, and Carnage had brought his namesake into effect; Tilyard received another eight-count as the blood streamed from his scalp. When the second round began, Corbett had found his feet and once again sent Tilyard to the canvas. The referee called off the fight seconds before his corner threw in the towel. Fight two was against his old stable-mate from the Boonchu gym, Thor Hoopman. 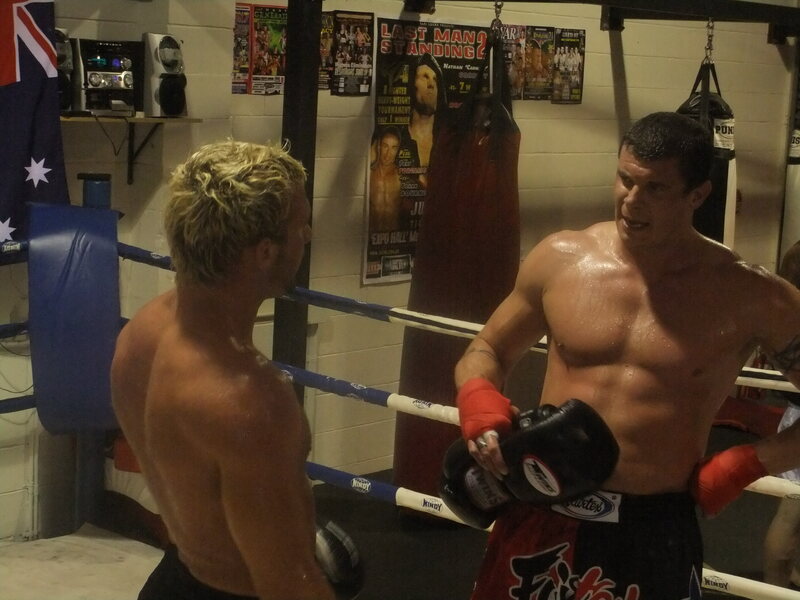 Thor is a rising star in Australian kickboxing, having previously fought Paul Slowinski in South Australia. Through a skilful, strategic fight, Thor had carried off the win. Given that Slowinski is the only Australian – and one of only two people ever – to beat Nathan, this matchup generated a lot of excitement. Thor is a gifted fighter and has other significant scalps to his credit, both domestic and international. The fight was of interest specifically in terms of providing an Australian audience with a clear impression of just how good Corbett is. Hoopman fought a smart and sophisticated fight, but Carnage seemed to somehow work inside his opponent’s approach and get the better of every exchange. The draw had been structured so that Carnage would either face off against the supremely talented Steve McKinnon or old foe Paul Slowinski in the finish. Both fighters met in a crushing semi-final in which they beat the absolute hell out of each other. To the crowd’s delight, McKinnon bought home the win in a sensational upset. Unfortunately, the cost was so high that it prevented him progressing into the finals. This meant that Cedric Kongaika would return from his first round loss. Solak, on a whim, decided that it should be fought with elbows. The crowd bayed its approval as Carnage, armed with his most potent weapon, cut a gutsy, determined Cedric to ribbons. It was the broadest weight range Corbett had fought in, and all after ten months of inactivity. Nathan won his three fights on the night and maintained his near-mythical status as unbeatable in his weight range, a range which has stretched to a full twelve kilograms heavier than his own. While Spong is now preparing for his next fight on the K1 circuit, Corbett is pondering his options. “Steve [McKinnon] and I should have met in Melbourne again [at Last Man Standing II],” he says. “They’re [the Bulldog Gym] barking for a rematch, so we’ll see what happens.” Corbett’s attention is now, however, clearly fixed on the international stage. “I’m thirty now, which is young in the sport, but I’m not interested in fighting any more Australians. It’s not that I think I’m bigger than the sport, but where’s it going to get me? After I fought Spong, I thought things would change, but there’s been no change. I had to fight in Melbourne to re-prove myself.” Carnage’s next fight will be in Perth, against Ukranian, Pavel Zuravlev. Zuravlev fought – and defeated – Dutch wunderkind Gokhan Saki at K1 Seoul in 2009. He stands at six foot one and weighs in at around 100 kilograms. He has a record of 31 fights for 27 wins, and counts 8 of them as knockouts. “I watched the Saki fight,” says Nathan. “Apparently Saki was injured, but he lost. Pavel is skilled… he has a good move-and-counter style. We’re fighting on September the 17th in Perth, for a WKN world title.” For Carnage, this fight is all about advancing his career through the narrow passage that ironically, his dominance has created. “You asked me what’s next for Nathan Corbett, and I’ll tell you,” he says. “I want to represent Australia on the big stage. I want to step up and fight names like Manhoef, [Gokhan] Saki, and rematch Spong.” We are now faced with the answer to the ‘What if?’ question Nathan’s victory over Tyrone Spong posed last year. Is Nathan the best fighter in the world at his weight, broadly defined now as a full twelve kilograms past his own? The answer to this question is now in the hands of promoters and sanctioning bodies. Let’s hope they do their job and give us the dream fights we want to see. This entry was posted on October 10, 2010 at 9:28 am and is filed under Journalism, Kickboxing with tags Gokhan Saki, Last Man Standing II, Nathan 'Carnage' Corbett, Paul Slowinski, Pavel Zhurilov, Steve McKinnon, Tyrone Spong. You can follow any responses to this entry through the RSS 2.0 feed. You can leave a response, or trackback from your own site.